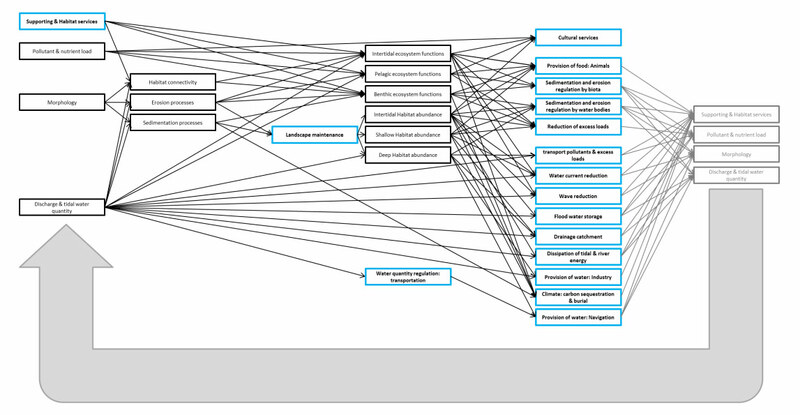 Following the separate descriptions of structures and processes involved in supply of these ecosystem services, the many interactions and interdependences between them are clear (see also Figure 10). The services described in TIDE are final services, directly linked to benefits, as well as intermediate services, which regulate processes involved in provision of other services. However, these intermediate services can also have direct benefits. All services impact on the main structures and processes which determine the overall functioning of the system, while finally all services are more or less dependent on habitat and supporting functions. Assuming that all these services have to be provided sustainably, the effect of optimizing structures and processes in function of a (set of) services on the long-term supply of the other services should be estimated. Unavoidably, any use of the estuary will have an impact. The challenge is to assess the risk of this impact to provoke system shifts which cannot be undone. This can only be achieved through building a comprehensive integrated model of the estuary, including quantitative data, verified indicators for ecological functioning and best available estimates, including uncertainties and knowledge gaps as risk factors. An illustrative backbone of such a conceptual model is shown in Figure 28. From Figure 28, it is clear that all services depend on certain common key drivers, such as discharge and tidal water quantity, morphology, pollution and nutrient loads. These affect services directly, or indirectly by impacting on quality and amount of certain habitats, or with a time lag, when (use of) services impacts future conditions (gray arrows in Figure 28). Adopting a functional approach requires a comprehensive ecological understanding and threshold estimation based on empirical data, through the integration of existing models, data and expertise gathered in TIDE and present in other estuaries. Figure 29: Illustrative scheme of interdependence of TIDE key ecosystem services (blue boxes), habitat abundance, habitat functioning and basic functions in the estuarine system. The grey boxes and arrows arrow represent the feedback of these services on the same drivers which determine their supply.